"We have been working with it a great deal and we’ve found out how to make the most of its power and versatility in a large variety of applications," says Ulrik Rasmussen, DPA Soundco Project Manager and system designer for the Elton John concert. "We’re now really confident that it has plenty of potential to compete with the top brands for the full range of pop, rock, heavy metal and corporate events. This makes it a lot easier for us to sell the system: when we are confident, it is easier to make to client confident. For Elton John, I simply quoted for the LA12, along with a complete production of screens, camera and lights." "We like to consider ourselves a company that doesn’t necessarily go for the mainstream," smiles Ulrik. "We prefer to find solutions that we believe in and then work with that – of course, we are always trying to hit perfection, but we know there are always new things to try." "We used them as a kind of ultrasub," he explains. "This gives more room for the SCPs to help the bass coupling between the 12 inch in the LA12 and the SCP’s 18 inch. Using the LA12 with SCP gives us better coupling and allows us to deliver a wide bass/lo mid powered system, but keeps the outstanding sub control from the comparator system in the C10 amps. "After I’d talked to Elton’s front of house engineer, Matt Herr, and before he’d listened to anything, I handed the system over without any EQ, just the factory settings and some hints about frequently used parameters," continues Ulrik. "I had just a bit of EQ shading on the bottom boxes and the top four long throw boxes. "Matt spent about 10 minutes tuning the system, talking into a microphone, and quickly came back with a comment about the system being nice and that he already felt confident. After that, he put on some music and walked around the venue to level each zone by ear. "The production manager and the rest of the audio crew also listened to the system and said it sounded great, and they were all happy after the concert." 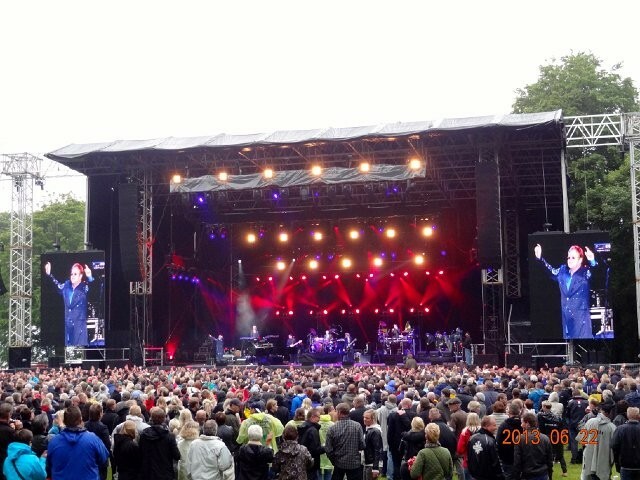 "We knew that Elton’s crew hadn’t used the Coda system before they came to Denmark," adds DPA Soundco CEO/director Sten Jensen. "But after playing it and walking the venue, they all had a thumbs up attitude. We had established a very good relationship with Production Manager Peter McFee and on-site Production Manager Henry Crallan, and after the concert they both expressed their satisfaction with the results we’d achieved with the Coda system. "At DPA Soundco, we think the Airline LA12 system is as good as anything out there, but with a lot of extra detail and throw. And it’s light enough to work indoors as well as out, which makes it a great year round solution for us." "I have been working closely with Sten at DPA over the last two years and it's great to see them delivering the highest of standards with Coda," concludes Anderson Ward’s Paul Ward, international brand developer for Coda. "They have done an excellent job of putting the brand where it deserves to be; at the very top."